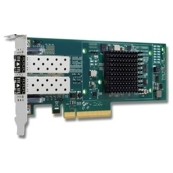 The Brocade 10Gb CNA for IBM System x is a PCI Express 2.0 x8 10Gb Converged Network Adapter with two optical SFP+ SR ports. The adapter can support either an SFP+ Multimode Fiber SR optical module or an SFP+ Active Copper cable. This adapter offers 10Gbps per port maximum throughput for high-bandwidth storage (SAN) and networking (LAN) traffic, with full hardware offload for Fibre Channel over Ethernet protocol processing. The convergence helps lower the total cost of ownership (TCO) with reduced hardware, power, cooling, and management and maintenance costs. It offers investment protection with seamless compatibility to existing FC storage networks, drivers, and management applications, all over a common IP network with Ethernet. With the PCI Express low profile card form factor, the adapter can be used in either a standard PCI-E slot or a low profile PCI-E slot. This adapter is supported for all IBM System x modular rack servers, including the latest PCI Express 2.0 Generation 2 servers.